One of the Central States of the United States of America; admitted to the Union Dec. 3, 1818. The Jewish pioneer of Illinois prior to its admission as a state was John Hays. He was sheriff of St. Clair county 1798-1818, and was appointed collector of internal revenue for Illinois territory by President Madison in 1814. The earliest Jewish settlement in the state was that in Chicago, to which city the first Jewish settler went in 1838; and up to 1844 he was followed by quite a number of Jews (see Jew. Encyc. iv. 22, s.v. Chicago). Some of these early settlers soon left the city, moving to Joliet, Will county; to Troy Grove, La Salle county; and to Grundy county; but they all returned to Chicago a few years later. Among these early arrivals in Chicago was Henry Meyer, an agent of a Jewish colonization society established in New York about 1842 by William Renau and others. Meyer was sent by the society to select in the vicinity of Chicago a suitable location for a Jewish colony. He purchased from the government 160 acres of land in the town of Schaumburg, Cook county; and on this land he settled as a farmer. He reported to the society that the land which he had bought was good land, and he recommended that some Jewish families be sent to the neighborhood. In consequence of his favorable report, a number of Jews soon went to Chicago; but only two settled as farmers near Schaumburg, the rest drifting into mercantile pursuits throughout the state. In the city of Peoria Jews first settled in 1847; in Quincy and Bloomington, in 1850; in Pontiac, in 1856; in Aurora, in 1861; and in Moline, in 1866. The settlements of Cairo, Urbana, Champaign, Frankfort Station, and other places in the state are of more recent date. Chicago had the earliest Jewish organizations in the state, the first being the Jewish Burial-Ground Society (established 1846), followed by the congregations Anshe Ma'arab (1847), B'nai Sholom (1852), Sinai congregation (1861). Since the establishment of these three congregations seventy-five have been organized in the state of Illinois, sixty-eight in Chicago, and eight in seven other towns. The total membership of these congregations is not less than 5,000; their annual income is fully $250,000; and their property value is about $1,000,000. Religious schools are connected with twenty-five congregations. In Chicago are located the most prominent Jewish institutions and associations of the state. Of the smaller Jewish communities in the state, the followingmay be mentioned: Bloomington (congregation organized in 1892); Cairo (congregation organized in 1894); Chicago Heights; Danville; Elgin; Joliet; Peoria (which has two congregations: Anshai Emeth, organized in 1865, and Agudath Achim, organized in 1897, besides a Council of Jewish Women, United Jewish Charities, and other Jewish organizations); Quincy (with a congregation, organized in 1870, and a Hebrew Ladies' Benevolent Society); Springfield (with two congregations, the first Beth Sholem, organized in 1865); and Waukegan. They contain 47 benevolent associations; 25 ladies' societies for charity and social purposes; 11 social clubs; 13 loan associations; 5 sections of the Council of Jewish Women; 4 Zionist societies; 20 lodges of the Order B'nai B'rith; 10 of the Free Sons of Israel; 8 of the Order Sons of Benjamin; 33 of the Order B'rith Abraham; and 25 cemeteries. Most of these are in Chicago. 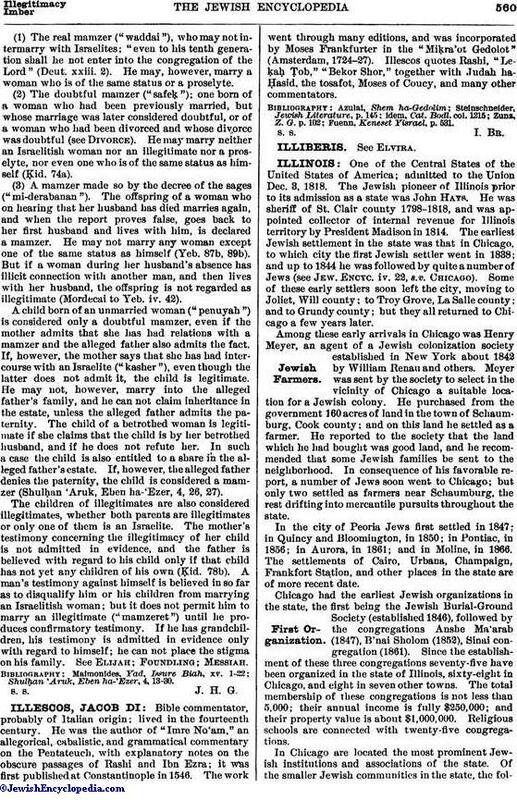 The Jews of Illinois are important factors in the commerce and manufactures of the state; and their financial power and influence manifest themselves in many directions. In the professions Jews are well represented; Jewish lawyers, physicians, architects, engineers, engravers, designers, pharmacists, rabbis, professors, teachers, and journalists being numbered by hundreds. In public life the Jews of Illinois have been and are honored by their fellow citizens with elections, and by the authorities with appointments, to positions of trust. Samuel Altschuler of Aurora was nominated for the governorship of the state by the Democratic party in the campaign of 1900. A number of Jews have held the office of mayor in several towns of the state. More than $150,000 is annually collected by the Jews of Illinois for non-sectarian institutions. The Associated Hebrew Charities of Chicago collect $130,000 annually. Within the last twenty years nearly $1,000,000 has been donated by Jews to Jewish charities. The Jewish inhabitants of Illinois are estimated to exceed 100,000, three-fourths of this number living in Chicago. Peoria and Quincy have the largest Jewish communities outside of Chicago, the former numbering 2,000 and the latter 600 Jews. See also Chicago. 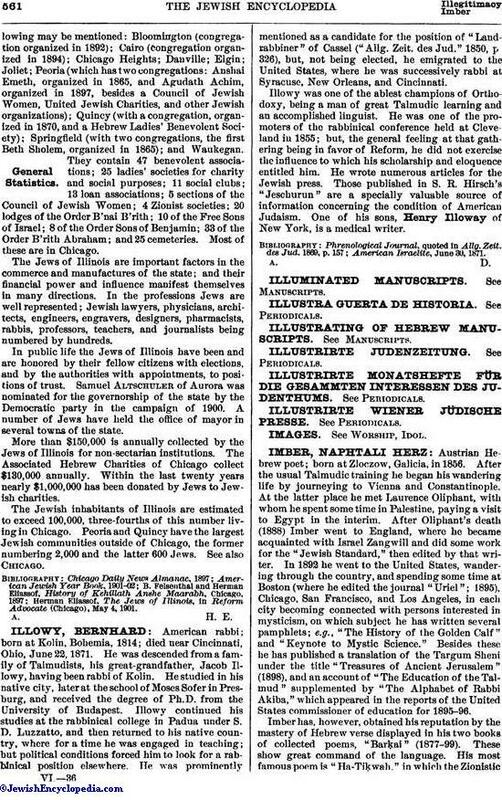 Herman Eliassof, The Jews of Illinois, in Reform Advocate (Chicago), May 4, 1901.